I’ve had terrible luck raising plants from seed the last two years. Nonetheless, I’m quite stubborn and know that if I learn how to do it correctly, I can succeed. Which is why I persisted in going to the Washington Gardener Seed Exchange this year. I’m hoping that the seeds will inspire me enough to try again and the skills learned will make my efforts fruitful (or vegetableful?). The first speaker, a University of Maryland-associated Master Gardener, perfectly met my educational needs on the subject. 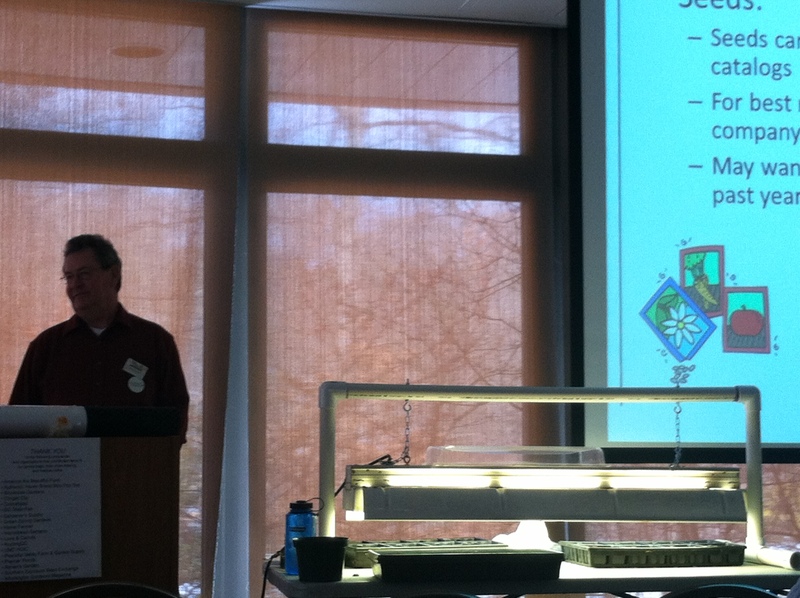 In fact, his whole talk was about raising seeds inside with lights. Even though experienced had taught me that raising seeds without grow lights is useless, I was a little skeptical of his talk. I had no question that raising seedlings under lights has numerous benefits, including producing stronger plants, planting the varieties you want to instead of the ones from the garden center, avoiding seedlings grown as a monocrop, and growing more plants over a wider season. However, I really wondered about the cost after seeing how staggeringly expensive grow light kits are. With starting prices of $459 in catalogs, there is no way in heck that could ever pay for itself. I haven’t spent that much money on my whole garden, including the compost bin and all of the tools. Fortunately, the speaker offered some very helpful information on that front. As with most things in gardening, it turns out you don’t need to buy super-expensive equipment. Instead, you can build the shelving out of recycled or salvaged materials and buy the lights separately from Home Depot. He said that he built his small set-up for $20, with lights an extra $35 and the heat mat about $25. (He recommended fluorescent T8 fixtures, about one foot by four feet for two flats of plants.) That’s less than a fifth of the price and much more environmentally sustainable. Inspired by his vision, I’m definitely going to be hitting up Habitat for Humanity’s ReStore and Home Depot to assemble my own seed-growing set-up. In addition to his do-it-yourself advice, he had some very useful thoughts on seed starting mix. You shouldn’t use garden soil as seed starting mix because it tends to be too dense and have harmful bacteria. Instead, you should use sterile, light, “non-dirt” mix. However, most of the mixes you buy from the store use peat moss, which requires harvesting from bogs, one of the most ecologically sensitive and endangered ecosystems in the world. When I brought this issue up, he said you can grow seedlings in homemade compost instead, if you bake it in the oven or on the grill. Baking it kills off bacteria, along with most weed seeds. You still may want to mix it with coconut fiber to make it less dense, but this method is a lot more sustainable than buying it from the store. The second speaker wasn’t as useful to me in a practical way, but definitely jump-started some creative thinking. She spoke on “creative kitchen garden ideas,” particularly a variety of unusual produce. The plants she showcased included yacon, a root vegetable from the Andes, blacktail mountain watermelon which does very well in both heat and cold, tropical and long-lasting Geramon Martinique squash, and banana melons that are resistant to heat. In particular, her description of mushroom popcorn inspired me. Unlike traditional butterfly popcorn, mushroom popcorn is rounder and less likely to break if you’re coating for kettle corn. While I had been resistant to planting corn previously, I actually ended up grabbing a packet of it during the seed swap session, emboldened by her recommendations. Like last year, the seed swap session was a lot of fun. Basically, the organizers spread out the seeds people brought in addition to the donated ones, and call up groups of people to pick out one seed packet at a time. Even though I paid for the event, it still felt like I was getting something for free. The slight sense of competition with other people just heightened that thrill. It was like Black Friday for gardeners but much more civilized. I grabbed a mix of plants I’ve grown successfully (albeit not from seed) and want to again – basil, tomatoes, peppers – and a few I want to try, like the corn. I also staked my ground that I will not give in to bug invaders by picking up packages of zucchini and butternut squash seeds. 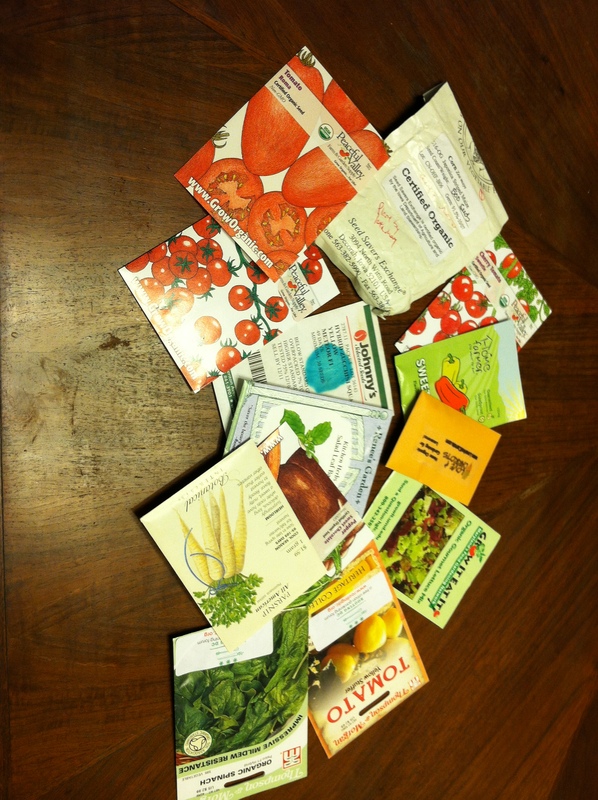 In addition to the seeds I chose from the tables, we also got a few in our “goodie” bags. While I gave away two packages of flower seeds, I did keep the nasturtiums because not only would they look nice in our front yard, but they’re also edible. My haul from the event! Overall, an afternoon well-spent on gardening information and community building. Now, I just need to get those seeds planted. Have you started plants from seed before and was it successful? This entry was posted in community, food, gardening and tagged food, gardening, saving seeds, seed exchange, washington gardening. Bookmark the permalink.